Preview features aren’t meant for production use and may have restricted functionality. These features are available before an official release so that customers can get early access and provide feedback. We expect changes to this feature, so you shouldn’t use it in production. Use it only in test and development environments. Microsoft doesn’t provide support for this preview feature. Microsoft Dynamics 365 Technical Support won’t be able to help you with issues or questions. As always, a huge thanks to all our customers who are successfully using Data Integrator (for admins) to integrate data into the Common Data Service for Apps. We are humbled to see the continuous uptrend in our usage numbers across all regions. Following our simple success mantra from the past, we continue to listen and learn from our customers and build features that they want. This release is no different and we are excited to announce the Preview of some hot new features and exciting updates to our user interface. The Common Data Service for Apps team recently announced the preview for the Power platform admin center; built to become the go-to destination for adminstrators creating, managing and supporting their environments. Primary goal here is to bring a unified admin center for our administrators. We have since worked very closely with the Power platform admin center team and proud to announce that the Data Integrator can now be managed from the Power platform admin center for Common Data Service for Apps. One of the top feedback we received from our customers is the need to share templates across tenants. You are a consultant or a tenant admin who customize a data integration template and once tested and finalized, have a need to push it to your production tenant. We are happy to announce that your voice has been heard and we now are providing an ability to push templates to users across tenants. This prevents the need to redo your templates and cuts down on cost and effort. Additionally, you are also able to provide name, description and version the templates. Up until now, a data integration project’s visibility was limited to the project creator/owner. Our customers, especially in the Enterprise space, typically need to have multiple admins working on data integration project and found this to be limiting. With this release, we are proud to announce a new feature which lets a data integration project creator/owner share their projects with others users in the tenant with Read, Update and/or Execute rights. This allows the flexibility to share your projects with granular controls wherein your can assign rights to view data integration projects, update field mappings and/or the ability to execute the project. Creating a Connection is the starting point of your integration. Before you can create a data integration project, you must provision a connection to each of your applications. 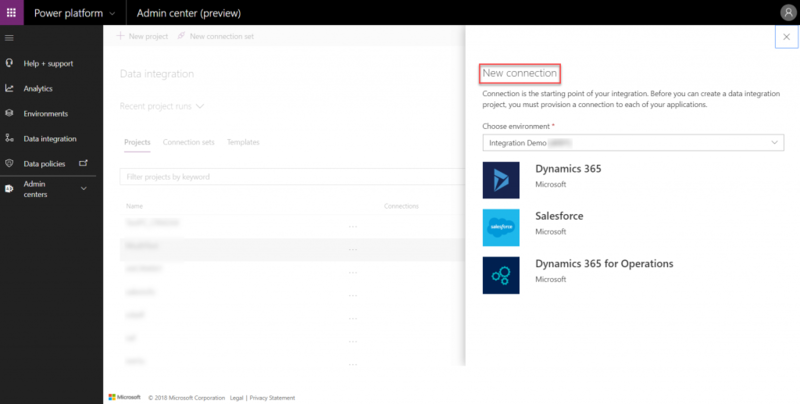 Until now, you had to create your connections Ex: Dynamics 365 for Finance and Operations and Dynamics 365 for Sales from the maker portal (https://web.powerapps.com) and then switch to the admin portal to create your data integration projects. With this release, we have unified this experience wherein you no longer have to switch between portals and can do all your tasks related to Data Integrator from the Power platform admin center. When you create a New connection set and don’t see your connections listed in the drop down list or if it is the first time time you are creating a connection, simply click on Add new connection from within the drop-down and you will be walked through a wizard to create your connections. We understand that our customers typically create several projects and customized templates during the test phase and searching for your projects or templates can be a daunting task. Same is the case while searching through the project execution history. With this release, we are now providing a way for customers to be able filter through their projects, connection sets, templates and project execution history. This is available on the project list page and execution history tab. 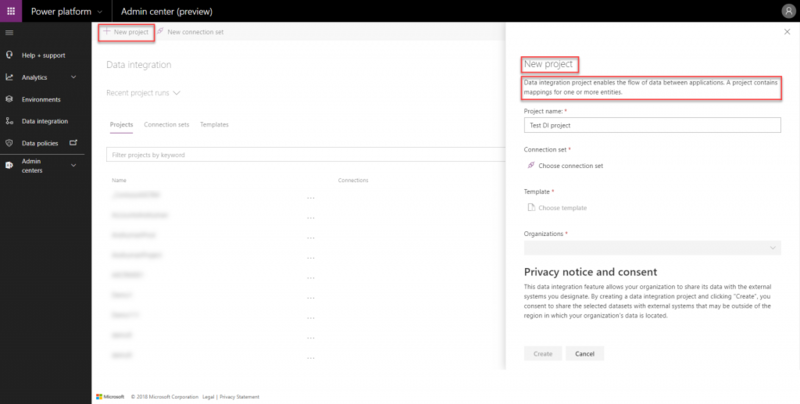 You will also be able to filter on connection sets and templates while creating a new data integration project. Additionally, customers can also increase the real-estate on the project list page by collapsing the Power BI dashboard. As you navigate through the portal, you will notice that all activities like creating a New data integration project, New connection set and/or connections have all been moved to the right panel making the overall experience more predictable and fluent. We have also provided description for each of the activities which should especially help our new users navigate the portal with ease. Once again, thank you for previewing our new features and our new user interface. As always, we would love to hear more from you, learn from your experience and improve based on your feedback. It would be great if you could please drop a line regarding your experience and any issues you may have encountered at CDSDataIntegrationPreview@service.microsoft.com – Thank You!